Welcome to CompuPed® Millennium for Microsoft Windows! To see a full-size screen shot, please click on the thumb-nail photos To come back here, click the BACK button on your browser. Here is a picture of the main window, with the animal information page displayed. Whenever an animal is displayed, CompuPed shows green dots on the information tabs wherever there is information of that type. This makes it easy to know what you have and do not have stored for any animal. CompuPed also tells you what record number you are on, and empowers you to sort and search on any information in the animal's record. We fully support an extra-powerful split-screen, just like CPed for DOS! Now view the record data andthe extra data at the same time. Bottom half data changes along with the top for extra power. Of course, CompuPed Millennium remembers what tab you select from session to session. 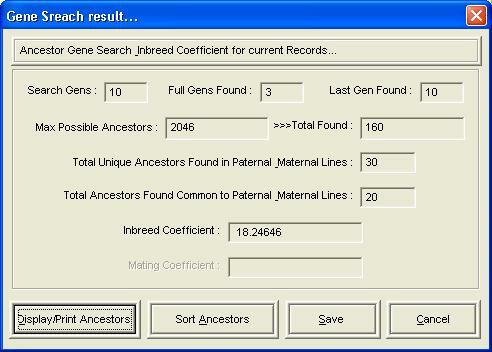 Genetic searching remains as accurate as ever, and speedier than ever as well. All features in the classic CompuPed™ are retained for your use. Time to introduce a powerful new feature... Animal Pictures. You can now add a BMP or JPG picture to any animal in your database! These will be usable in the pedigree and reverse-pedigree reports. Now, you can come all the way into the 21st Century with CompuPed™ Millennium! Now, CompuPed™ Millennium remembers up to 64 dogs you choose with F2, F3 or F4 keys (F2-Search F3-Sire Drill, F4-Dam Drill) for the session. And, instead of just choosing the F5 Key to drill back through this list, we also offer the Recent Records tool bar (shown, click to see full-screen image) Choose any animal on the list, click Go, and be immediately transferred to that animal, without losing any of that list! 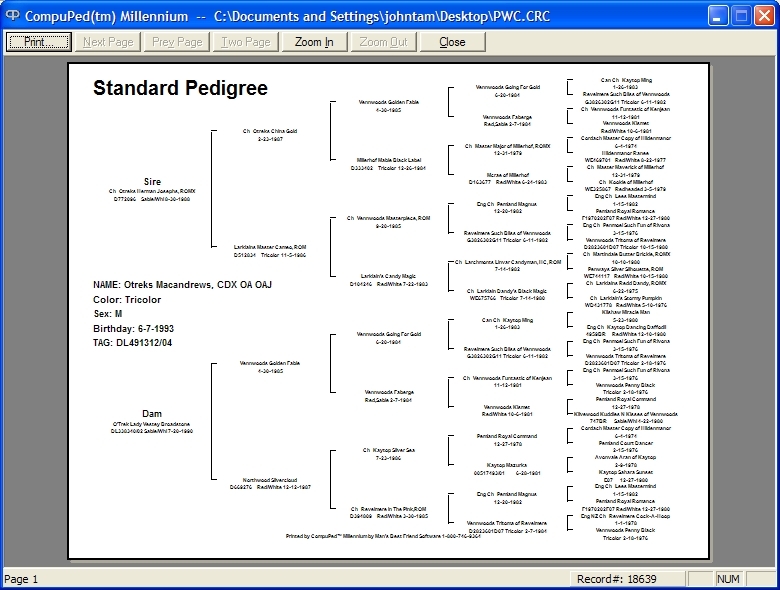 CompuPed Millennium has moved the Standard and Extended pedigrees into native Windows mode, complete with a Print Preview window! Of course, as you would expect, we have kept template pedigrees, including luscious HTML pedigrees that you can immediately post to your web site. 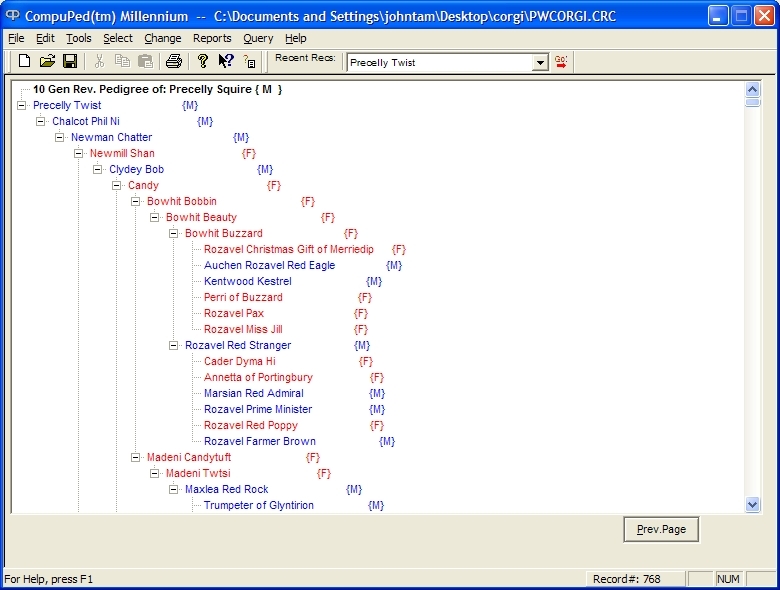 Interactive Yet Printable -- our Innovative Reverse Pedigree! CompuPed™ Millennium has the ultimate reverse pedigree. It is both interactive and printable. You can collapse descendants and expand them at will, across ten generations of descendancy. Get a great idea of the other successes you may find among the progeny of your foundation animals! Then when you are done browsing, you still have the power to print the whole thing out and analyze it on paper! Interactive, yet printable. Just what you needed. When you need help -- just ask! How do I print a pedigree? How do I calculate the coefficient of relationship? Don't know? Need an instant answer? Use our built-in English Language Help. CompuPed™ Millennium joins our other flagship programs in offering the ability to ask the program for instructions in simple English, and to get the help you need immediately, with a list of the help file topics that have the needed information, in order, starting with the most relevant help. How can any program offer you less and still consider itself user friendly? And our help doesn't stop with a list of topics. The online help is lushly detailed. There is a huge "how Do I" section, and every function is completely documented with clear and easy instructions. 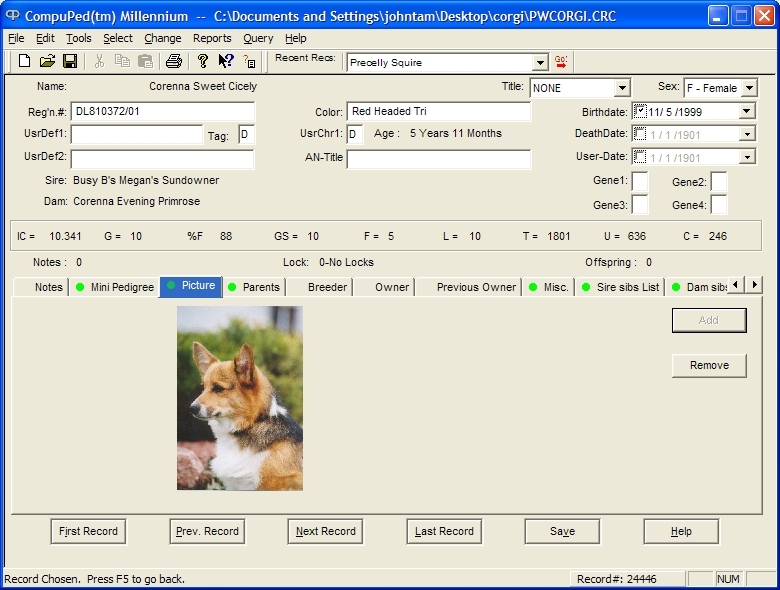 CompuPed™ Millennium can be downloaded immediately for a 14-day trial, or you can purchase it right now and get spectacular power in your pedigree research - now! 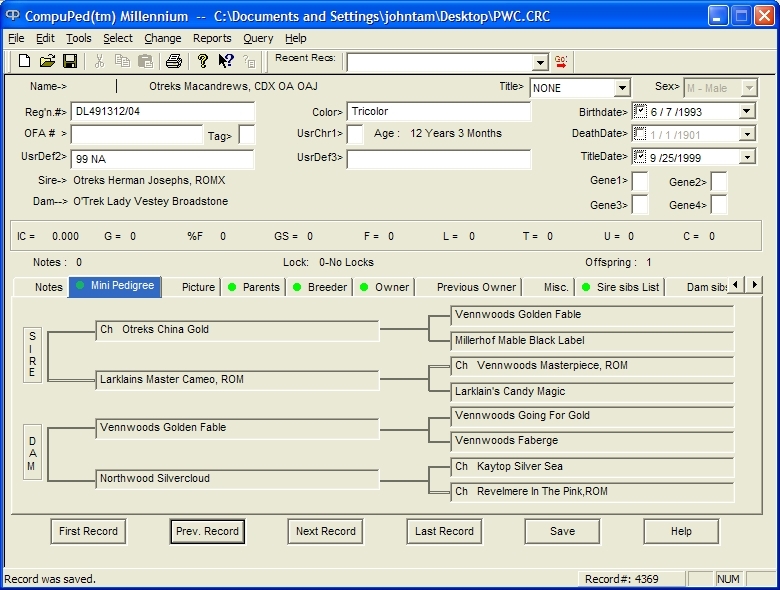 CompuPed Millennium will read CompuPed 4.x format, but it converts the database for use in CompuPed Millennium, and you should make a backup of your breed files before opening them in Millennium for the first time. If you registered any previous test edition with your pre-order codes, you'll have to reregister -- sorry. Requires Windows 98, Windows NT, Windows 2000, Windows XP. You need at least 256MB of RAM, 15MB of free disk space (not including breed files), a Pentium III processor, S-VGA graphics or newer. CompuPed Millennium is not supported on 64-bit operating systems, Windows Vista, 7 or 8. It may run on these systems but we do not support it on anything newer than 32-bit Windows XP. If you require Windows Vista/7/8 and/or 64-bit Support, please use The Breeder's Standard, The Cattery's Standard, or iPed. Others make promises. We have delivered!